Arnold Schwarzenegger's nickname of "Governator" is no longer just a joke, with Stan Lee turning it into a comic book and television series. By day, Arnold Schwarzenegger is a bodybuilder turned actor turned California governor with an exhausting-to-type last name. By night, he's the same things, except in Stan Lee's upcoming comic book and animated series Governator where he's also a high-tech crime fighter. Schwarzenegger says Governator will combine the world of politics with the Terminator, bodybuilding, and movies. The main character will use personal aspects of Schwarzenegger's real life, such as his wife Maria Shriver, but add a crime-fighting center underneath his Brentwood, California home. The Schwarzenegger version of the Batcave will house multiple super vehicles, a closet of "super suits" that give him special powers (such as flight), and a team of crime-fighting experts like 13-year-old computer whiz and cybersecurity expert Zeke Muckerberg. I don't even want to go into the scandal that could arise from the public finding out Arnold Schwarzenegger keeps a 13-year-old in his basement. Schwarzenegger says: "I love the idea of a control center below my house with a path so that boats and submarines can go right into the ocean." Who wouldn't? 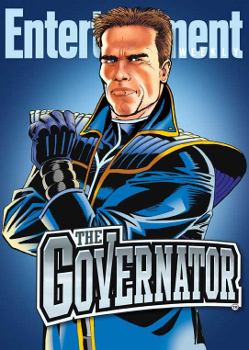 Governator will also feature silly supervillains such as the G.I.R.L.I.E. Men, or the Gangsters Impostors Racketeers Liars & Irredeemable Ex-cons... Men. Governator is yet another feather in Stan Lee's cap of properties that seem like a joke at first, but are real, such as when he turned every NHL team into a superhero. The basic idea sounds a little odd, but that doesn't mean an at least slightly entertaining property won't come out of it. Arnold Schwarzenegger mixed with Batman, fighting the G.I.R.L.I.E. Men? That could be kind of funny, or an enthralling train wreck, and everyone wins either way. Author's Note: This could easily be an early April Fool's Joke.